This last month has been a busy time for Eli – lots of new skills emerging and lots of things to learn. 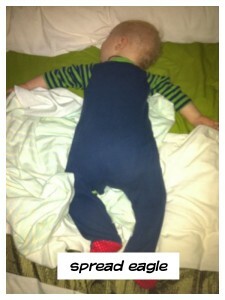 So, what is Eli like at 13 months? Weight: 20lb 11oz (9.4kg) (in vest and nappy now he no longer needs to be stripped down to get weighed). Teeth: 2 bottom central incisors, 2 top central incisors and top right lateral incisor. Mobility: crawling very, very fast, able to stand without support for as long as he wants to, able to squat and stand up from a squat (doesn’t need anything to pull up on anymore), walking! – taking up to seven steps at a time and really trying to walk instead of crawl, won’t be long now until he’s a fully fledged toddler. Communication: still screeches for attention but much less now, says ‘dis’ (meaning ‘I want to look at this’, ‘give me this’, ‘what is this?’), ‘der’ (meaning ‘take me there’ – usually pointing to outside) and ‘um, um’ (meaning ‘yum, yum’ which I always say to him whilst he’s eating, can clap and wave but generally prefers not too, still very occasionally signs milk, signs more with one hand, he recently went through a stage of shaking his head most gravely if I said no (now he just ignores me). Eating: doesn’t eat much but generally not bothered by tastes (did spit out an olive which I’m in full agreement with as they are yuck), will mug me for anything I am eating, likes to throw his food on the floor for the cats to eat (he learnt this early on and finds it most entertaining), I’ve just started giving him a spoon or fork for every meal which he thinks is fantastic. Personality: just a wonderful baby, happy to play by himself but likes to come and see me for the occasional cuddle, interested in everything, really enjoying having books read to him (especially those with textures to feel). We’ve had a busy month, with the two big kids in school most of the time Eli and I have been spending lots of time with friends and at various groups. Eli particularly likes groups with older children he can play with – he enjoyed playing in cardboard boxes with an almost 2-year-old at our ones group yesterday. With all his recent advances I’m looking forward to the next month and even more new skills. Walking home from school, along the busy bit of pavement where lots of parents are loading children into cars, Lex tells me he’s been reading Shakespeare’s plays. Oh I say, which ones in particular? Julius Caesar he tells me. That’s nice I say, what happens in the play? He gets stabbed mummy – in the head! Now Lex is not quite seven so this little interaction made me feel like I was about to be the subject of a ‘OMG performance parent alert‘ thread on Mumsnet – ‘AIBU to think that going on about Shakespeare on the school run is a tad pretentious?’. In my defence he brought it up unprompted and I tried not to be too loud about it but this totally validates my Book People addiction – the book he had been reading is from a set of books by Marcia Williams. 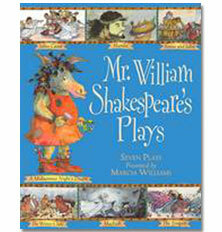 Not quite Shakespeare unabridged and in the original but clearly accessible to Lex so how very cool is that? I resisted the urge to explain this to the mother just behind us, she probably wasn’t listening and if she was it most likely would only have cemented my place as performance parent of the afternoon (even if there’s a trophy I’d rather not win that – unless of course the prize is chocolate, I could parent really loudly for chocolate). All the books in the set brilliant introductions to various classic stories – Lex enjoyed the Greek Myths book during his Olympic theme during last term and has, erm, read a bit of the Canterbury Tales recently – but I particularly like the Shakespeare books. They’re each set as a comic strip with an contemporary explanation of what’s happening underneath each panel but the dialogue is all original and there’s a cartoon audience to give additional help to the kids in understanding the plot. I love that my son enjoys reading as much as he does and he knows about Shakespeare and that he wrote a play called Julius Caesar. He’s not planning on reading the Tempest though. Apparently that looks too romantical and he’s not interested in that sort of thing. Whilst not having to get out of bed or really even wake up when the baby needs feeding in the night are my absolute favourite things about co-sleeping, finding out exactly how Eli has decided to orientate himself each night is entertaining too. Accordingly I have been taking photos (blurry as it’s hard to get enough light to take a photo without waking the baby!). Then there’s back-to-front: generally given away by moaning and rustling over the baby monitor, I’m guessing this is what happens when he goes looking for me when he stirs, rotates himself, gives up and goes to sleep. Normally these positions only affect my ability to get into bed without disturbing Eli and if I don’t have to move him my own ability to get under the covers comfortably. 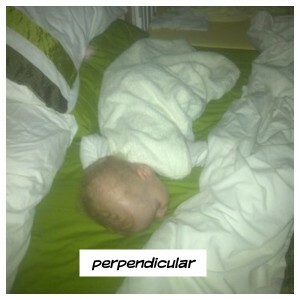 When perpendicular comes into play, R gets to join in too. I mean, so what if your parents believe that they should have most of the bed (especially after buying the biggest one they could after years of co-sleeping on a double), clearly the bed is for the baby. 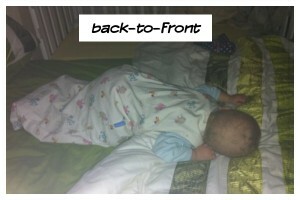 The cot on the side is, however, clearly not. That has surely been placed there simply to allow for clothes storage and for the rare occasion when you might otherwise fall out of the bed. If you do end up accidentally sleeping in it you should protest loudly until you are removed to the proper bed. In having three children R and I have found ourselves on unfamiliar ground. I am the eldest of two and R the youngest – middle children are a whole new experience and Tilly is ensuring that we experience every last little bit. Eli’s first year has clearly been a little tricky for Tilly. Before he arrived she had been the baby of the family for almost 4 years and was quite happy in that position. Now she does love her little brother (sometimes a little too much) and has never really shown much resentment towards him. Occasionally when his existence prevents her from doing/having something she wants she gets a little grumpy with him but he is forgiven very quickly. Mummy and Daddy (but especially Mummy) bear the brunt of her annoyance. Tilly is a self-confessed daddy’s girl and Daddy is somewhat more indulgent towards her than I am so it’s not exactly unsurprising. Over the last year she has suffered from a lack of attention from both sides and in recent months it has very much started to show. The constant attention seeking over the summer holidays was hideous because it didn’t matter whether the attention was positive or negative – it just had to be attention! Sometimes I manage this really well (i.e. I don’t end up shouting and screaming like a demented banshee) but with lack of sleep (thanks Eli) my response was not always helpful to the situation (think more inflammatory and tantrum prolonging dammit). Handily starting school has made a difference – she is either far too tired, or getting so much attention there, that she doesn’t have the energy/need to seek it at home. Thankfully, too, as Eli gets older it is becoming easier to give Tilly the one-to-one attention she craves and thrives on. So hopefully, we’re entering a calmer, less upsetting time for all of us. At least she’s the only girl – must be nice to be unique when you’re stuck in the middle. Considering Lex was well over 6 when he lost his first tooth, it was a bit of a surprise in the summer when Tilly told us she had a wobbly tooth. It stayed wobbly for a while until last Thursday when it fell out at school. Luckily the school are obviously well practised at this and it came home in an envelope all ready for the tooth fairy. 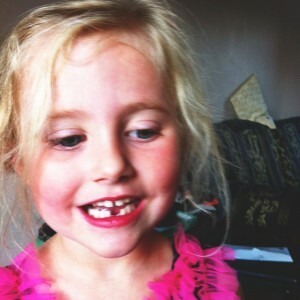 The kindly tooth fairy did indeed leave £1 for an excited little girl. She promptly asked to change it into ‘school money’ two 50p so that she could buy snacks from the snack trolley. Since they only sell fruit and veg I was quite happy to agree. At the same time, Eli is suffering through the arrival of two new teeth. 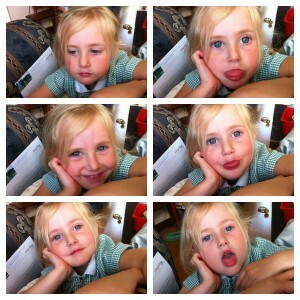 One, the top right lateral incisor is through (last week when Tilly lost her tooth) and the left is on its way. 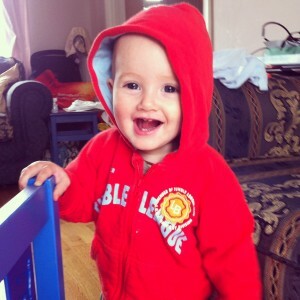 This does account for my lessened posting routine on this blog – teething is tiring! 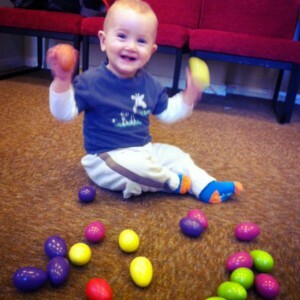 Eli thrilled to have more egg shakers than he could ever hold at our favourite baby group. 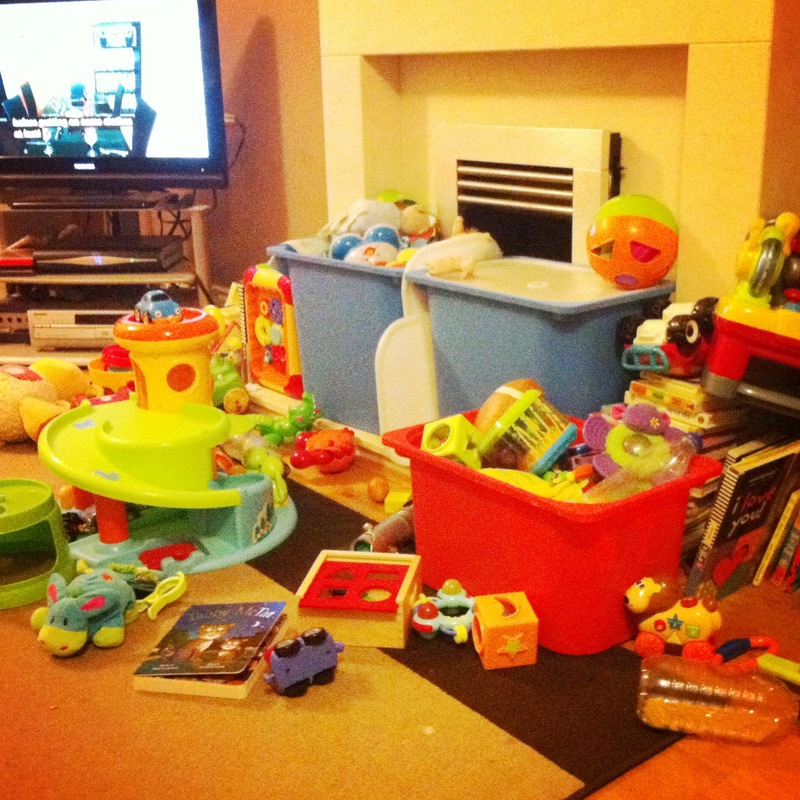 I used to be really worried about attending new baby/toddler groups. It seemed too intimidating to walk into a room of people I didn’t know and try to join in (why yes I do have a little social anxiety, how could you tell?). Subsequently, when Lex was a baby we didn’t go to any baby groups. I eventually started taking him to swimming lessons when he was about 5 months old but as I returned to work (3 days a week) when he was 6 months old that was about all I managed to do with him. I feel sad now for not going to groups where I would have met some lovely people – my local LLL group for example – but I was just too worried about not knowing anyone. Of course it’s really hard to meet new friends if you don’t go anywhere to meet them! When I was pregnant with Tilly I started looking for things that we would be able to do once I was on maternity leave. My lovely SIL took her son to a group that she thought was great, run by (my now friend) L. and so we started doing that – it was fantastic and we still go. I took Eli to L’s baby group today (and the photo of Eli with the treasure basket, that I use everywhere, was taken there when he was about 4/5 months old). 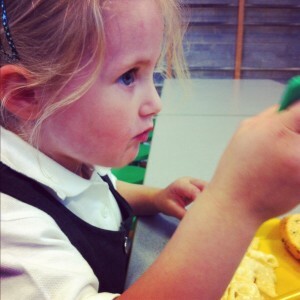 In the first year of Tilly’s life we went to a lot of groups – library, toddler group, LLL, swimming and L’s groups. Almost everyday had an activity and it was great fun. When I returned to work I couldn’t attend many but it was fun whilst it lasted. I know not everybody enjoys baby or toddler groups but I knew that I wanted to find things for Eli and I to do together – I never went to baby groups with the big kids and I really wanted to this time. Toddler groups weren’t really appropriate this time anyway, Tilly didn’t enjoy them anymore – she’s an October baby so, at 4, found most groups too babyish with not many kids her own age. Thankfully my Mum was able to look after her at times – taking her to the zoo or having her to play at her house – to allow Eli and I to find our own groups. Baby massage at the children’s centre, which I managed to gather up the courage to book by phoning (yup, phone anxiety too dammit) lead to what was a lovely baby group. That group ended today – we were chucked out over a month ago because Eli was crawling (didn’t stop other crawling babies from being allowed…) but due to staffing blah blah they have stopped the group for now. I thought it would be nice to go to the last one (we were there for the first!) and asked yesterday at the Tuesday not-quite-a-group-but-a-chance-to-meet-up (though we have started calling it the see you next Tuesday group…). You’d think it was the most unreasonable request in the world – I received a reply, which I pretty much tuned out as the tone was horrible, about keeping the group rules intact and what if there are new little babies? Firstly, this is the last group do we really need to stick to the rules (especially when you’re breaking them for others)? Secondly, my friends still attended the group (Eli is the eldest) and over the last month there have been no new people at all. I’m rapidly going off my children’s centre (or at least the manager) the atmosphere, once lovely and welcoming, is now more annoyed and bored of us (the clients!) sadly. To end this long! saga of baby groups, I went to a new group instead, for one year olds at another local children’s centre. I was brave and it paid off. This looks like it will be a lovely group for the next year and whilst I’m looking forward to our friends reaching their first birthdays and joining us I think we’ll also have fun on our own before they get there.